First you prepare the leek and peel two of the carrots. You can use everything that you cut away for the veggie stock. To prepare it, you have to cut the onion in eighths and crush the garlic with your knive. Don’t peel them as their peels hold a lot of taste. Wash the celery root and the remaining carrot and chop them roughly. Next you heat some oil in a big pot and fry the veggies and peels. Then you put in the pepper corns and a piece of ginger and roast them till fragrant. Pour in water until the vegetables are fully covered. Then bring it to a boil, season with some salt and let the veggie stock simmer for a minimum of 30 minutes with the lid put on. In the meantime you can prepare your soup ingredients. Therefore you cut the leek in half and finely slice it. Then you blanch it in some boiling salted water and put it in the oven to keep it warm. Next you cut the carrots into thin strips, blanch them and keep them warm as well. Now you fry the shiitake mushrooms with some oil and add them to the oven. Cook the eggs for 5 minutes until soft, refresh and peel them and cut them in half. Then prepare the ramen noodles according to the package instructions. Now you strain the veggie stock, season to taste and bring it to a boil again. 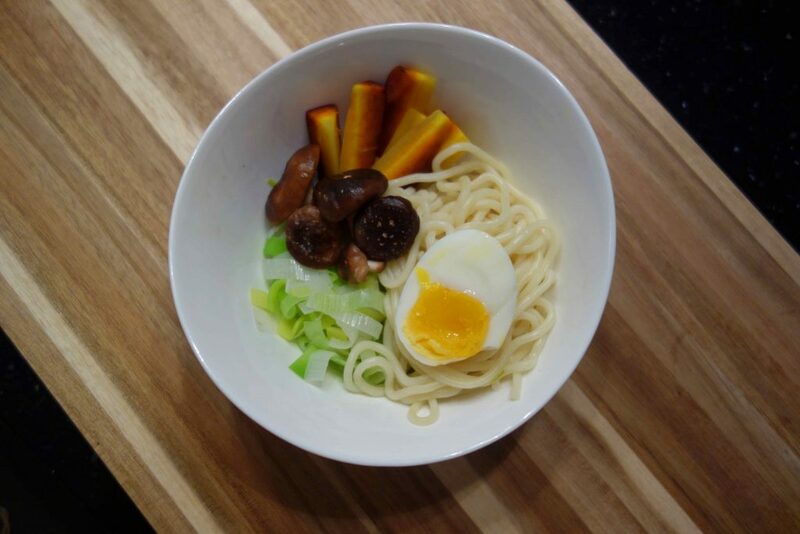 Take two bowls and nicely arrange the blanched vegetables, ramen noodles and your soft boiled eggs. Pour the boiling veggie stock over it and you’re ready to eat. 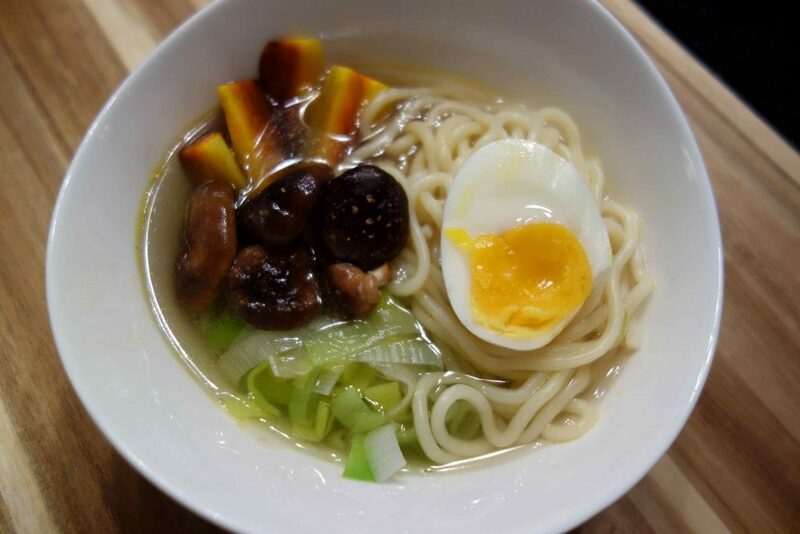 Of course, you can choose any vegetables you like, but the most important thing is definitely a good homemade veggie stock.